If you’ve been reading this blog for a while, I think you can probably imagine the state of our house. Let me recap: we have four kids, each of whom likes being creative and messy. I enjoy starting (and not necessarily finishing) craft projects. My husband works from home. I’m Chair of our PTA. Seldom does a week go by when our home isn’t providing an extra storage space for several boxes of school tombola prizes, all the paraphernalia from a church kids’ club, or four large cardboard boxes, each of which has been lovingly pimped with sequins and pipe cleaners by one of my children into their very own racing car/sofa/gaming chair. I enjoy this creative, busy, messy life – but I also (although my home doesn’t show it) like order and space. If I’m honest, I don’t really like clutter. So when I came across Clutter: Sorted!, a decluttering guide written by home organising expert Chrissy Halton, my ears perked up and I decided to try it – although, of course, I knew it wouldn’t actually work. Except I was wrong. It is working. Rather well. To give you a taste, here are some things I was wrong about. I thought I was quite good at decluttering. However many systems I’ve set up in my home, doing this course has reminded me that there’s always room for improvement. For example, I’ve realised just how many items in our home have two or more storage spaces. This wastes a lot of time when looking for things – and yet from day to day there’s not always the time to put everything away in its rightful home. So we tend to put things down in handy places, and before long there’s a second place where such-and-such might be found. Decluttering with an organised method like the one Chrissy’s written has helped us to sharpen things up around the home. We’ve decided on logical places to store things – i.e. places where we actually use the item in question – and we’ve also changed things round where they could be working better. Clutter is the mess you can see. We have a tendency to stuff things into drawers and cupboards just to get a room to look tidy. It’s human nature, right? Out of sight, out of mind. Chrissy’s approach, though, is different. Her definition of clutter is “anything that doesn’t belong to the space it is in”. With this definition, we’ve had to sort through those cupboards and drawers, and make sure that everything in them is being used. It’s been a total joy to discover just how much can go to the charity shop, or to friends who can make better use of an item than we can! It’s also been an eye opener as to how disorganised we actually are. 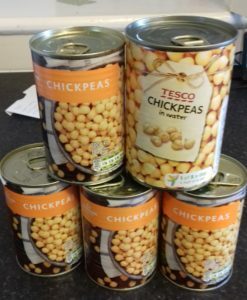 Who needs five tins of chickpeas? 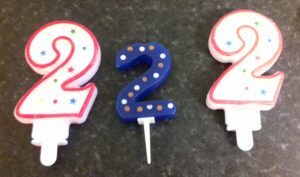 Or three number ‘2’ birthday candles? Seriously, the next time we’ll need all three of those is when the twins turn 22. In 18 years’ time. Hmm. Hey – we even have some empty space in some cupboards now! This is actually OK. Who knew? There’s better uses of our time than decluttering. Again, I’ve found this to be untrue. Since starting this process, we’ve made over £100 by selling bits and bobs on eBay or local selling sites (and this is after giving most stuff away for free). That’s worthwhile in itself. Aside from the financial benefit of decluttering, we’ve also found that it’s a natural way to make our home work better for us all. For example, in our hall, we used to have a basket into which was thrown all manner of small things which we wanted to tidy up – keys, sun-cream, lanyards, small toys, lip balm…you name it. When I decluttered it, however, returning everything to its rightful home, I found only two items, both of which could easily live in my handbag. We then had an empty basket, which definitely didn’t want to stay put, otherwise it would be filled with clutter again before you could say “Do I really need eight coats?”. DesertDad pointed out that the basket would do a better job of storing remote controls in the living room than the receptacle which was currently doing the job, so we moved it there, and used the living room basket to store toiletries in the bathroom, tidying up our windowsill. A win for all three rooms! 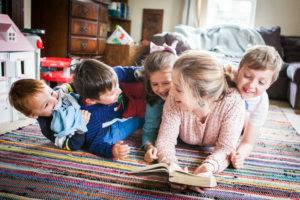 Decluttering a family home is only possible once all the kids have left home. Honestly, I really did believe this. I assumed that clutter was just something we’d have to put up with for the next 15 years. I was resigned to it. But this isn’t the case – I’ve completed six of the 20 areas so far, and have to say that, although hard work (what worthwhile task isn’t? ), it definitely IS possible. Moreover, I believe it’s vital. We have far too much Stuff in our home – and it doesn’t benefit anyone, least of all my kids. They’re growing up oblivious to the vast majority of entertainment available to them, because they simply don’t see it anymore. By significantly reducing the number of toys, books and games they own, they’re able to better see what they do have, and play with it more. Decluttering is like painting the Forth Bridge – once you’ve done everything, it’s time to start again! I thought I was quite good at decluttering before. But it took me AGES to get round to doing it. I’d have a few trouble zones on my list, and every now and again I’d get round to doing one of them. Then the next, then the next – but by the time it had all been completed, it was time to declutter the first area again. On Clutter: Sorted! Chrissy leads you through the house, room by room. She includes the garden, shed, garage and car – and even allows for weeks spent decluttering your paperwork, to-do list, photos (digital and actual), and emails! What’s important, though, is that each area just takes a week, and Chrissy helps you break down each area into manageable chunks, so it never feels like you’re doing a lot at once. Now I’ll be honest here and admit that I’ve had a busy few weeks, and have fallen a bit behind. But I allowed for a few busy weeks in my plan, so am still on track to finish the whole house by the end of January – not bad, considering I began at the start of September. It’s impossible to maintain a decluttered home. Again, not so. Chrissy gives a lot of tips for maintenance, and helping things stay as they are, now that you’ve found some space. One of the ideas which has worked particularly well in our family is the ten-minute evening tidy-up routine. After dinner, we whack on some music, set the oven timer, and get everyone involved in clearing up whatever they can in that time. We clear away the dinner things, load the dishwasher, wipe surfaces, sweep floors, tidy the lounge, put shoes and bags away in the hall – and it’s amazing how, by the end of just ten minutes, the downstairs looks pretty good! The kids then get their post-dinner sweets as a reward – it works wonders as a motivation tool! I love that this way of doing things gives me a bit more time back in the evening too – and it’s giving our kids essential life skills, which I blogged about on Monday. Win win! I can’t recommend Clutter: Sorted! highly enough – it really is opening my eyes to all sorts of ways our home could be working better for us. I’m actually starting to love my home again! In fact, I’ve been getting so much from this that I asked Chrissy if I could become an affiliate (i.e. I receive a commission if I sell any of her products or courses). I’m not doing this because I have to – I’m doing this because I totally believe in her experience and wisdom! NOW…stay tuned for the fun part. Usually this course retails for £59. While this may seem a little on the pricey side, consider how much you’d be paying if you hired a professional declutterer – probably around £35-40 per hour. And Chrissy is a professional declutterer. You get all her wisdom on the course itself, a very helpful workbook, and access to a VIP Facebook group where Chrissy is on hand to answer any specific questions you may have. BUT…I’m all for a bargain, so I’ll happily admit I never paid the full amount for Clutter:Sorted! I got it as one of many resources in the Ultimate Homemaking Bundle back in April for just over £20. Sadly, this bundle sale has now ended, but look out for next year’s bundle in the spring! 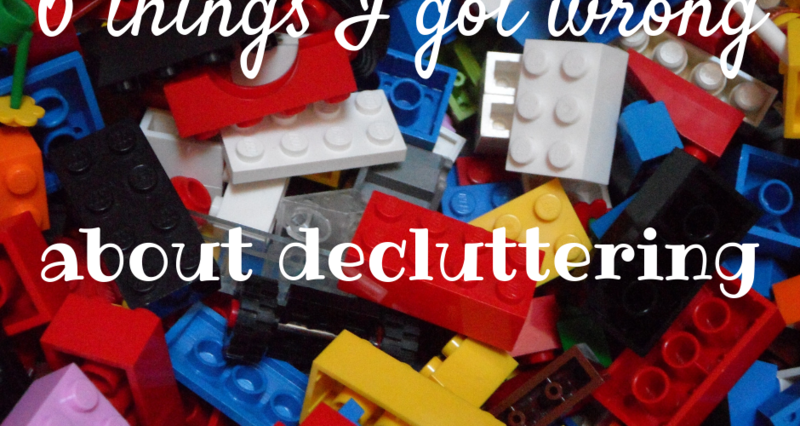 Over to you – do you enjoy decluttering? How often do you get round to it? Are you naturally a hoarder or a thrower? And don’t forget to subscribe to Desertmum – you’ll receive ’10 Tried-and-Tested Tips for Newly Adoptive Parents’ as a thank you! Oh my goodness – I need this in my life. Sleep deprivation exhaustion and spending far too much buying 2nd hand “bargains” means our house is overflowing again. Pingback: How do I teach my kids to cook? Pingback: Rest: is it even possible? Pingback: Fashion for mamas: can it be practical AND stylish? Pingback: Christmas Gift Guide for Grown-Ups! Pingback: What does the Bible say about therapeutic parenting?